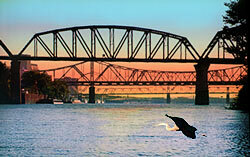 Welcome to the Louisville Rowing Club! 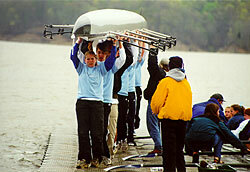 Come on in and discover why rowing is one of the fastest-growing sports around. The LRC includes members of all skill levels who enjoy rowing sweep (teams in which members row one oar each) and sculling (usually individuals in two-oared boats). The LRC offers lessons in 2003 from June through September. We also have an active program for students from several high schools, as well as Adaptive Rowing for people with disabilities. 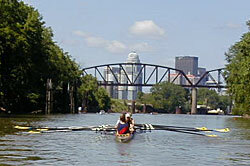 We row a variety of club boats -- singles, doubles, fours, eights, and pairs -- out of two boathouses along the Ohio River. 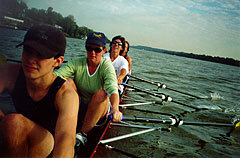 Because rowing uses all the major muscle groups, it provides a superb workout. It also offers a chance to form some great friendships. Rowers get to know the Ohio in a whole new way: early morning mist rising off the water, the splash of oars on a crisp autumn afternoon, a heron flapping lazily by, and at dusk, the red yolk of sun dipping behind a latticework of bridges. "It's a perfect combination of the movement within the boat, the oars stroking through the water, the bodies swinging back and forth, and you just feel lifted out of yourself. It's truly a transcendental moment, and it's what makes rowers fanatical about their sport."